Katherine Tegen Books, 9780062278111, 240pp. Fans of Jeff Kinney's humor and Sharon Creech's heartfelt stories will love this hilarious new series about a ten-year-old boy from a big family who dreams of making it into The Guinness Book of World Records. Teddy Mars is determined to stand out in a world full of wonders and a house bursting with siblings. With the help of his best friends, Teddy tries to build the biggest snow mound, stuff the most grapes in his mouth, and lift a chair with his teeth. He'll do anything to succeed—even if it means sleeping in a tent and cleaning up pigeon poop for Grumpy Pigeon Man. Too bad his pesky little brother, also known as The Destructor, always wrecks Teddy's record-breaking plans! 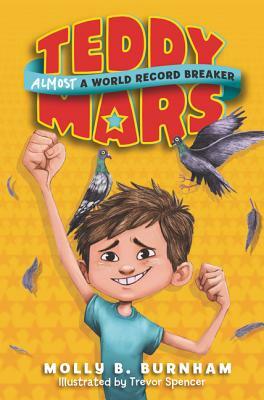 Told in short, accessible sections, with memorable lists and winning illustrations, Molly B. Burnham's Teddy Mars #1: Almost a World Record Breaker is perfect for reading aloud. Teddy's never-give-up attitude will have readers laughing out loud and clamoring to break records of their own! Molly B. Burnham has been a dog walker, ice-cream scooper, and elementary school teacher. She lives in Massachusetts with her husband, two daughters, and a dog named Pepito. Pigeons really do live next door to her. Sadly, Grumpy Pigeon Man does not. Molly earned an MFA in children's writing from Hamline University. This is her first book, but not her last. She has not broken a world record—yet! Trevor Spencer loves animated films almost as much as Teddy Mars loves world records. Trevor fills his days with making toys and drawing books with his lovely wife in California. His evenings are dedicated to bringing Teddy Mars to life, and he couldn't be happier.